Electricity supplies have returned to normal following countrywide blackouts on Tuesday, the National Grid has said. Hundreds of thousands of homes and businesses across London, Cheshire, Merseyside and East Anglia lost power. Blackouts were caused by Sizewell B nuclear plant in Suffolk and Longannet coal-fired station in Fife going off-line within minutes of each other. Storms overnight have left some people still without power but operators have said they are working to restore it. Units at Longannet were operating again on Wednesday morning and at about 2000 BST Sizewell B nuclear power station was brought back online. The blackouts were caused by the opposite of a power surge as the National Grid deactivated local stations to maintain the required 50Hz frequency. When demand is greater than generation, the system fails, the National Grid said. 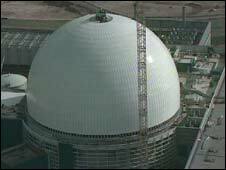 British Energy said they were working to bring supplies from Sizewell B back onto the National Grid but this could take several days. A spokesman for Longannet said they had four units but two were under long-term maintenance for the effects of sulphur emissions and two were down as part of their summer programme. David Porter, chief executive of the Association of Electricity Producers, which represents the companies that generate the UK's electricity, said the problem was caused by several smaller issues that occurred at the same time. "It was a huge coincidence. A couple of large power stations just within a few minutes of each other suffered breakdowns and the loss of power was more than the system is designed to take. "People were without power for 30 or 40 minutes I believe. Everybody in the industry is very sorry but it doesn't happen very often." Independent energy consultancy, McKinnon and Clarke, has advised the government to build new power stations or face further power cuts. David Hunter, energy analyst at the company, said: "The government's inability to make long-term energy security decisions over the last decade is coming home to roost. "Since the 'dash for gas' in the 1990s, the lack of political will to make tough decisions has left Britain short of power."